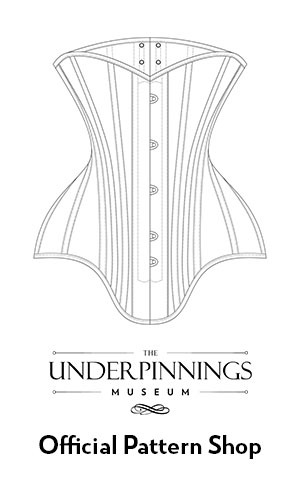 Welcome to the first exhibition of The Underpinnings Museum. This exhibition has been carefully curated to present a cross-section of our extensive object collection: it acts as an overview of the underwear worn between 1900 to the late 1950s, pared down to only 13 exquisite items. Each garment reveals a wealth of information about their time period, from the ideal body shapes of the era to construction techniques and delicate craftsmanship. Each object is accompanied by commentary explaining its selection. Clicking on the images will lead to a page exploring the object in detail. 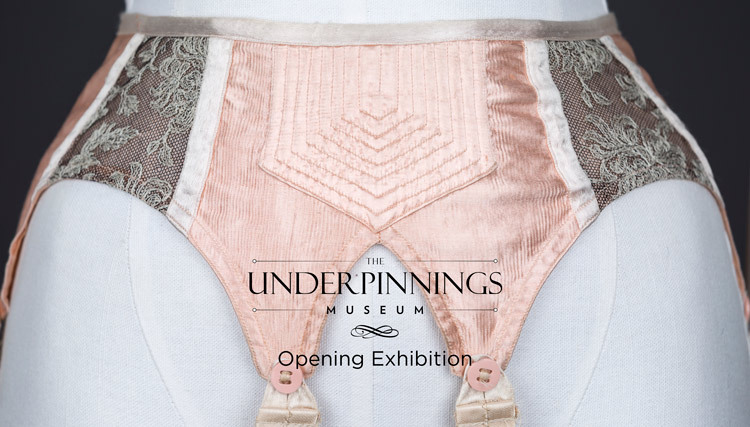 It may seem odd to focus solely on the first half of the twentieth century for the launch exhibition of The Underpinnings Museum, but the developments during this era were some of the most dramatic in Western underwear history and all took place in a relatively short period of time. Considering the changes in style that slowly emerged throughout hundreds of years of fashion history, the 1900s to 1950s provided a staggering amount of design and construction evolution in only a few decades and underwear was often at the forefront of this innovation. So much so, that when NASA were developing a space suit in the 1960s that would enable Neil Armstrong to survive in the vacuum of space and walk on the moon, they called upon Playtex seamstresses who had the skills needed to construct and sew extremely precise seams without the use of pins. From 1900, changes in women’s underwear began happening more rapidly than ever before. The wearing of drawers or knickers became common and, as skirts lengths shortened, became closed-crotch in style. They evolved from voluminous garments made from plain fabric into short close-fitting garments featuring delicate lace and embroidery. Corsets changed shape and length, moving away from the bust to fully cover the hips – which created a gap in the market for brassieres – and embraced new fibre technology, including the revolutionary stretch of Lastex and the wonderful easy care properties of nylon. It is difficult to imagine today, but undergarments with zero stretch and with complicated laundry requirements were frustrating in many ways. Close fitting garments without stretch must be made to measure or altered to fit, and boil washing clothing to remove stains – before the development of detergent that worked in lower temperatures, and the introduction of automatic washing machines – meant that a wardrobe full of fancy undergarments was something accessible only to the rich. Silk corset with suspenders, circa 1900s. France. Although the condition of this garment betrays its age, much can still be gleaned from it about the extravagances of the Edwardian era. Made from a single layer of floral brocade silk, this corset is cut with a typically complex diagonal flowing pattern, with vertically placed boning channels to maintain tension. Embellishment is profuse, with a delicate embroidered tulle flounce at the bustline, silk rosettes at the centre front and suspender straps and subtle flossing embroidery at the boning channels and gore points (much of which is hidden underneath the tulle). What makes this piece particularly fascinating is the fact that it has velvet-encased padding at the bust: certainly this would have helped to achieve the idealised S curve figure of the period, and acts as an early example of the ‘push up’ effect now commonly found in modern bras. 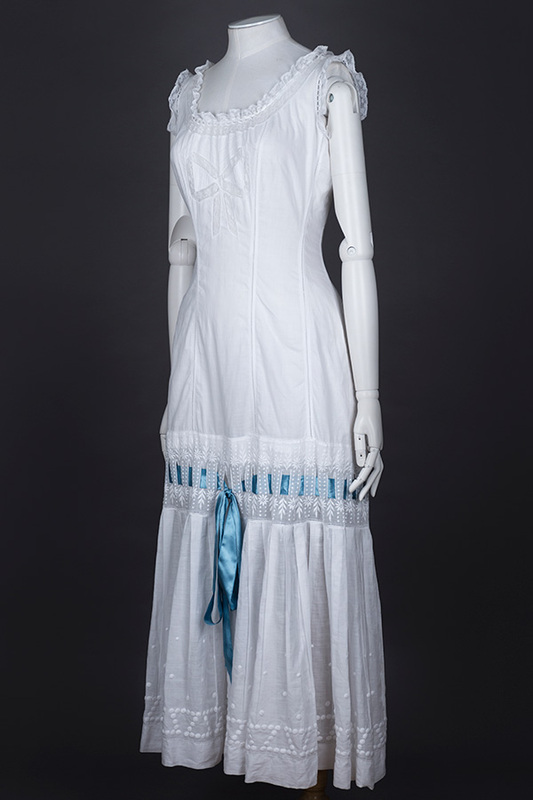 Cotton lawn and bow appliqué chemise, circa. 1910s. Great Britain. This Edwardian chemise is an exquisite example of restrained extravagance. The princess-line cut of this garment gives a smooth and flowing line to the body, with this garment having been traditionally worn beneath corsets against the skin. The attention to detail and embellishment on this piece are easily missed upon first glance, but further study reveals a great deal of skill. Embroidery is extensive, from the faggoting stitch of each seam to the whitework at the thigh and hem. The blue silk bow gives a playful pop of colour to this piece, where the otherwise pure white details all blend into one another. 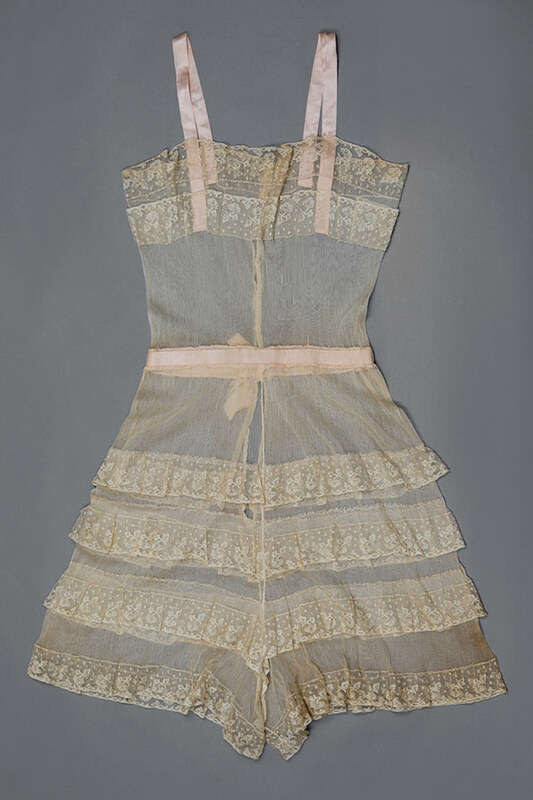 Silk tulle & lace step-in teddy, circa late 1910s – early 1920s. Possibly Great Britain. This piece is utterly delightful in both its delicacy and scandal. The silk tulle that makes up the body of this piece is incredibly soft and fine, and, as a consequence, completely sheer. One can only assume that this would have been worn as a boudoir piece than regular undergarments, regardless of the lingerie extravagance of the era. The embellishment on this piece is wonderfully playful: delicate silk leavers lace edges the neckline and is tiered in ruffles along the legline. Not uncommonly for this era, this garment has been sewn entirely by hand. By the time Warner’s introduced their ‘Merry Widow’ in 1952 – named after the popular Lana Turner movie ‘The Merry Widow’ and variously referred to as a corset, a corselet, a torsolette and a strapless cinch-bra – beautiful underwear was more affordable and easier to care for than ever before. The Warner’s ‘Merry Widow’ and its many imitators are good examples of the Victorian-style corsetry that was made popular again after the Second World War by the nipped in waist of Christian Dior’s ‘New Look’ silhouette. Constructed from sheer nylon with stretch panels, and spiral steel bones for structure and shaping, these garments weigh a fraction of their predecessors and would have been more comfortable to wear and extremely quick and easy to clean. A return to the hourglass shape which was popular a century previously may appear to be a step backwards, but corsets never really went away. The fashionable silhouettes of the 20s and 30s were achieved by most women with the help of corsetry, and girdles enjoyed continued popularity the 40s even when wartime restrictions meant they had to manufactured with fewer steel bones. These decades also saw a move away from natural fibres like cotton and silk towards manufactured and synthetic alternatives such as rayon – also known as artificial silk, or ‘art silk’ – and nylon. By the 1950s, long cotton chemises which were worn underneath corsets in order to protect these difficult to wash items from the skin, had become nylon slips worn over a bra, knickers and suspender belt. The bra went from humble beginnings as a ‘bust bodice’, often merely designed to protect a woman’s modesty under sometimes rather sheer Edwardian blouses, and became an extremely complex garment providing shape, support and uplift for the breasts. 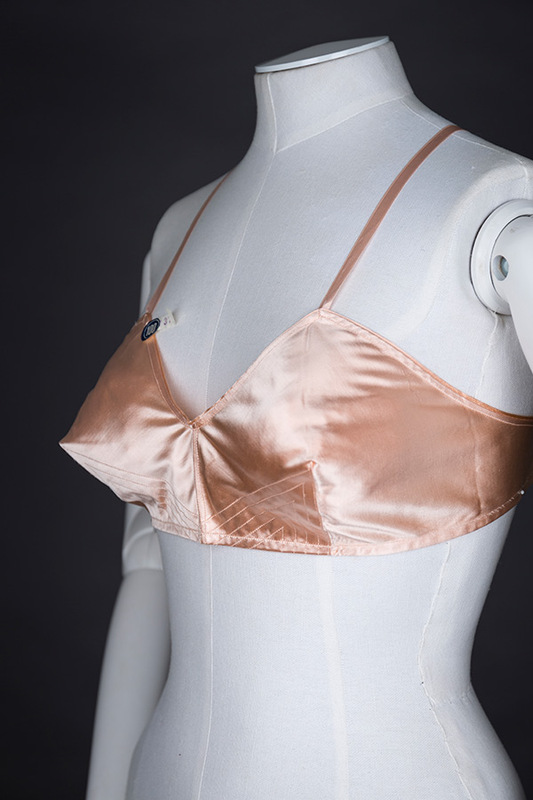 Comparing the soft simple style of a Kestos bra from the 1930s to the complicated construction, padding and wiring of 1950s bras is the perfect way to show why the early twentieth century is so important to the study and making of women’s underwear. Boudoir cap, circa 1920s. USA. The boudoir caps were commonly worn between the 19th and 20th centuries and the 1920s represented one of the most extravagant time periods for this garment: treated as a piece of lingerie, they became canvases for profuse embellishment. This piece is made with a base of embroidered tulle and has lace rosettes, ribbonwork, streamers and velvet floral posies. Although previously worn to cover undressed hair, the 1920s saw the cap worn more commonly to protect newly-fashionable short hair styles during sleep. The Kestos shape is iconic in the bra’s history: this bralet is thought to be one of the first commercially produced bras the offered seperated cups, and represented the shift from the flattened chests of 1920s bandeau bras. This object isn’t an official ‘Kestos’ brand product, but was likely instead custom made for an individual wealthy client. This is evidenced by the costly construction techniques and fabric: the piece is entirely hand sewn from silk, with delicate embroidery at the tops of the cups. It would have likely been a very expensive piece at the time. Tap pants became popularised in the 1920s as the alternative to the cumbersome Edwardian ensembles of layered petticoats, corsets and split drawers. Although early renditions of the tap pant style tended to focus on rectangular shapes with ‘ribbon’ style gussets, the 1930s saw a more fitted approach to these knickers. This pair have the typical yoked pattern and shaped gusset panel. What makes this pair particularly remarkable is the repeated heart motif, which is both visible as a satin appliqué on the front and back, but also as a particularly time-consuming hand embroidery to appliqué the yoke onto the lace of the legs. The entirety of this garment is hand sewn, a process which would have taken many hours. This exhibition also highlights an era when terminology used to refer to women’s underwear was different to that used in the early twenty-first century, and so it is also worth briefly exploring those definitions. 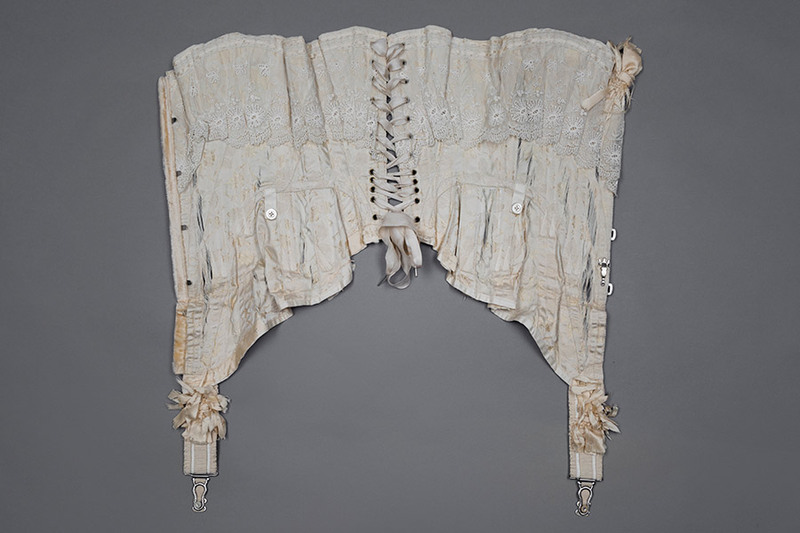 Although The Underpinnings Museum may appear to be a resource dedicated to the history of lingerie, items like the Edwardian silk corset would definitely not have been put in that category at the time it was worn. Going by the early twentieth century usage of the word, less than half of the objects selected for this exhibition would qualify as lingerie. The rest would be classified as corsetry or hosiery. These very clear distinctions between different types of feminine undergarments continued for over half of the century. In the 1950s, undergarments for women were still split into two distinct categories by UK retailers: corsetry and lingerie. Listed under corsetry you would find structured underwear such as bras, girdles and suspender belts. Lingerie was a term used to refer to looser garments and knitted underwear such as knickers, camisoles, slips, vests, nightwear and dressing gowns. 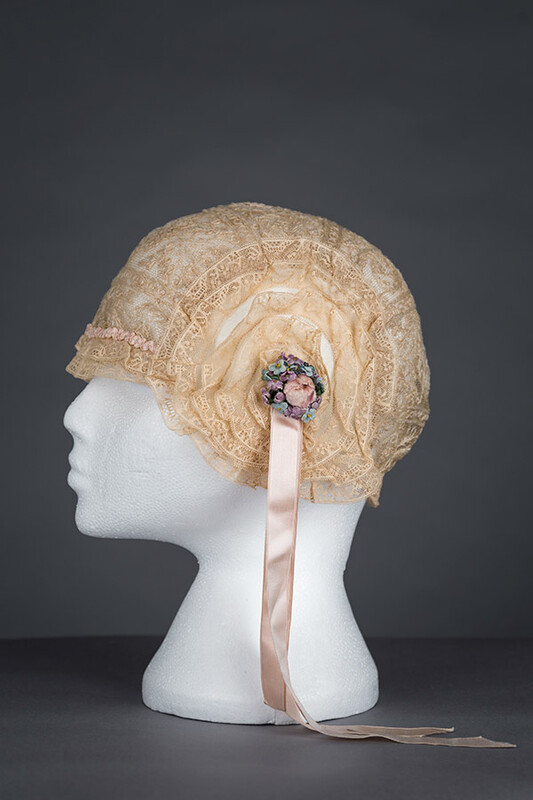 The inclusion of nightwear in the category of lingerie at the time the exquisite boudoir cap was produced means that this garment, although clearly not designed to be worn under anything else, most definitely belongs as part of underpinnings history. The tap pant style’s popularity continued for several decades. This pair were made by renowned couture lingerie designer Juel Park, most likely in the late 1940s (nylon first hit the market in 1938 and due to wartime scarcity was a highly sought after and luxurious fabric). The cut and application of the lace (intricately machine stitched, a process that requires great skill and accuracy) represent an attention to detail that is largely lacking in most modern, luxury lingerie. Satin and embroidery suspender belt, circa. 1940s. Great Britain. This gorgeous suspender belt would have originally been custom made for its owner and actually has a sister in the collection, made in ivory satin with slightly varying embellishment. Excluding the suspender straps, there is no elastic in this piece whatsoever: it was made to fit its owner’s waist exactly without any real flexibility in fit. The silhouette of this suspender belt is part of what helps to differentiate it from later renditions of this garment: the suspender straps are much more oriented to the front of the garment, with the front straps very narrowly placed and the back straps at the side of the body. However, as the straps are attached to the garment by way of buttons and loops, this means that they have a certain amount of flexibility in positioning, as they are able to pivot around these points. The quilted front panel and button loop fastenings represent a higher attention to detail and aesthetics than it would have been possible to source during the 1940s due to wartime production shortages, again indicating that this piece would have been custom made. Quilted satin bra by Liberation, circa. 1940s. France. This satin bra is one of the simpler garments in the initial thirteen object with a simple darted cup shape, clean machine stitching and only two functional panels of quilting to act as embellishment. But this 1940s bra also acts as a marker for a very important shift in the world of bras: the popularisation of elastication. The addition of a strip of elastic to the centre back of this garment represented the move towards fit flexibility in bras, eventually leading to the elasticated wings that we now take for granted. This particular bra was acquired alongside its original cellophane packaging, which contains the somewhat puzzling image of a lingerie-clad woman emerging from an egg! These knickers were likely never worn on an ‘everyday’ basis, with the heavy duty fabric, high cut leg and wide gusset indicating that these were probably designed for performance rather than comfort. This is further emphasised by the fact that the original owner’s name is written on the interior of the garment by pen. 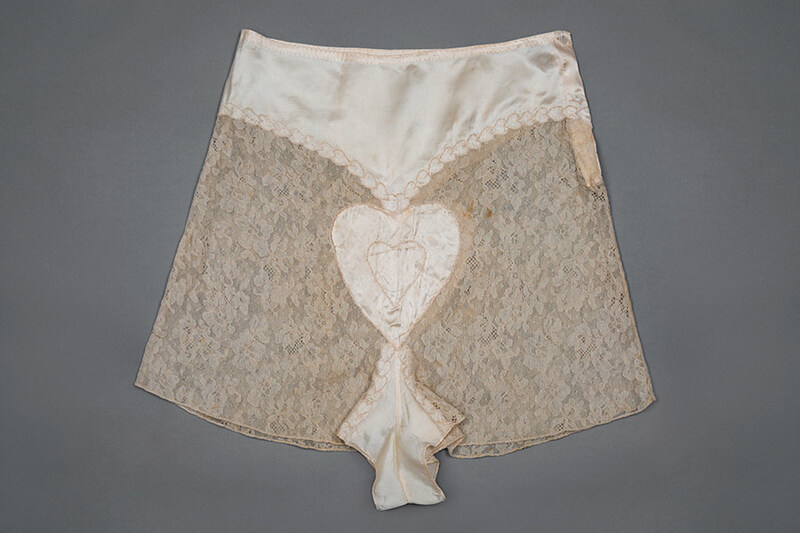 The suspender straps were stitched into the garment by hand by an owner rather than the manufacturer, further suggesting that these knickers were worn for performance: the placement of the straps are cut of the knickers would make them somewhat ineffective for keeping stockings in place for a full day. 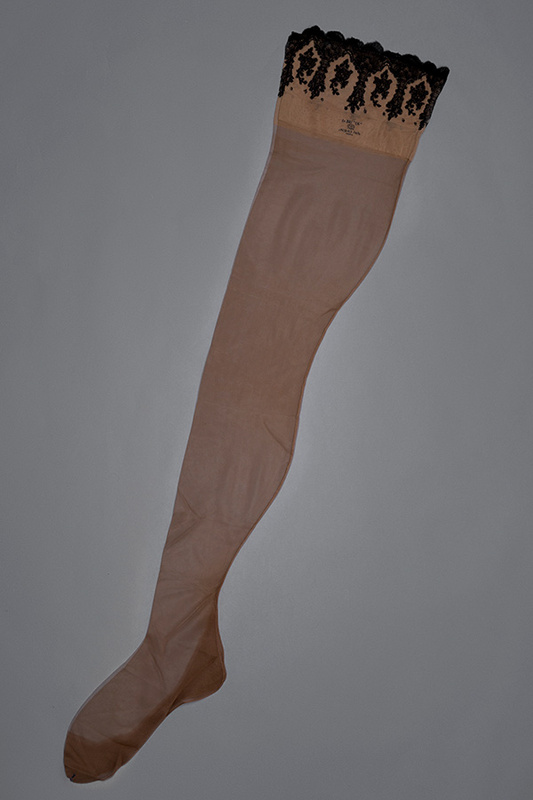 These exquisite lace, sheer nylon, fully fashioned stockings represent the peak of hosiery glamour for the 1950s. They were purchased at the Jacques Fath hosiery launch at London’s Harvey Nichols department store in 1954, one of the Parisian couturier’s first forays into ready-to-wear products. The embellished welts of these stockings feature carefully cut and machine stitched leavers lace appliqué: such embellishment represents hours of skilled work and marks them as a decidedly luxury product. U-wire low back bra by Formfit, circa 1950s. USA. The ‘strappy’ lingerie look is often associated with contemporary design but it in fact made its debut much earlier. Rather than for aesthetic purposes, the use of elastic strapping and cage structures in this bra are decidedly functional: they offer adjustability (something decidedly lacking in bras up to this point, with even adjustable shoulder straps not making a consistent appearance until the late 1950s) and outfit ‘solutions’. The U-wire at the front would allow for plunging necklines, whilst the cross strap back for low backs. The ‘corselets’ of the 1950s are one of the first incarnations of what we would now recognise as the contemporary basque. This shapewear acted as a fusion between heavier shaping capabilities of corsets and girdles, and the lift and support of underwire bras. The use of stretch fabric panels offered new comfort and flexibility, whilst spiral steel boning still offered structure and cinching. The 1950s also saw the introduction of padding into bra cups, offering new possibilities for lift, support and shape. This particular garment also has some lovely examples of embellishment: the front panel features lace that has been hand-cut into a scallop shape, appliquéd on and edged with tiny tulle ruffles. To summarise six decades in 13 garments was a tough task, but we hope that this selection of museum objects gives you a taster of the collection plus a desire to learn more about fashion history and also the lives of the women who made and wore this clothing. The study of foundation garments can tell us so much more than simply what was the fashionable silhouette of the time. Thank you for visiting! We hope to introduce our next exhibition, ‘Lift & Separate: Technology and the Bra’ at the end of May 2017. If you enjoyed this exhibition, please consider donating to the museum. All donations go to the upkeep and overhead costs of this project so that we can keep it online and continue to bring you beautiful and educational content.